V2 are known for their revolutionary approach to vaping. The Vertx is no exception and perhaps the pack leader in small scale vaporizer pens. Their e-cigarettes and vaporizers are hailed as the best in the business and each new release is anticipated by vapers and e-cigarette fans alike. The full V2 Vertx review follows. 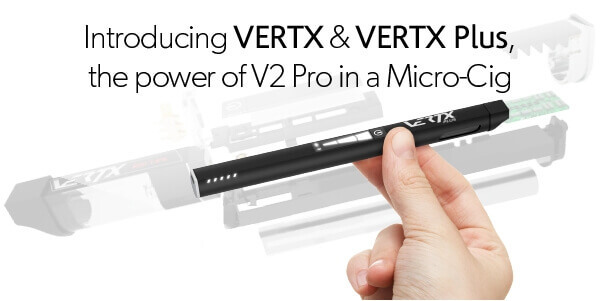 For those who don’t necessarily like the larger box type vape devices and want a modern small powerful vape pen, the V2 Vertx ticks the boxes. There were early issues with the electronics but these should all be ironed out now. Announced at the Sensory Theatre event in London, Vapour 2 announced their new vape pen the V2 Vertx, a revolutionary micro e-cig. The “product is the result of two years of research and development” according to Jan Veleur, co-founder of V2. The Vertx comes in two forms, the basic model and the Vertx Plus edition. This looks like a game changer and is being talked about as being “the most advanced micro-cig ever“. V2 Cigs have a great reputation in the vaporizer and e-cigarette market, consistently releasing some of the best vaping products in the vaping world, and the Vertx is no exception. The first thing to note about the Vertx vape pen is the unique shape and design features. The Vertx features flat surfaces, which stops your ecig rolling off a flat surfaces such as a table. The electronic touchscreen interface is flush to the surface of the Vertx vape pen, which adds to the slimline style of the ecig. This is the only micro e-cig on the market with a touchscreen. Simply by swiping across the VERTX’s face, vapers can easily adjust both the device’s LED indicators and the heating element’s voltage — from 3.5V to 4.5V. 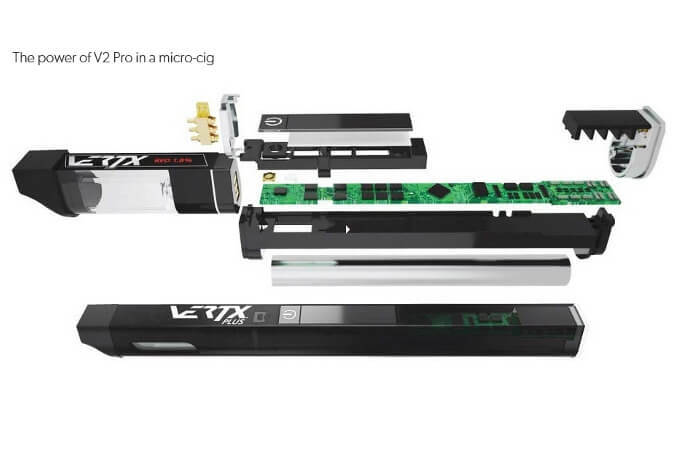 The Vertx uses pre-filled magnetic cartridges that you simply slot into the e-cig. This reduces the chance of leakage as there are no threads to line up. 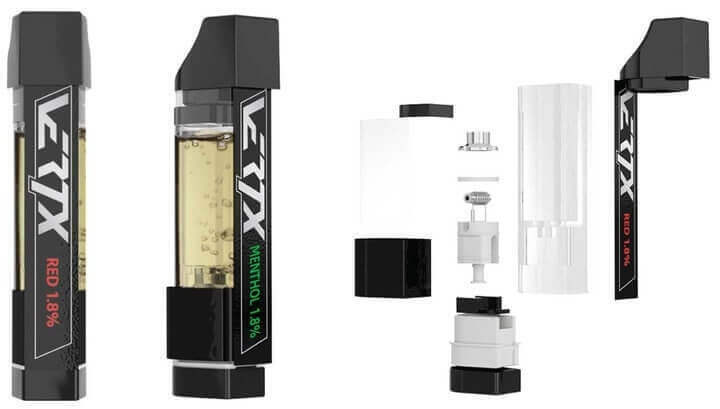 There is also an option for refillable Vertx cartridges (Vertx Blank) for those who prefer to use their own e liquid to fill the device. The high capacity magnetic cartridges in the Vertx means a longer life between refills, as well as more ‘puffs’ per cartridge. V2 are indicating upwards of 500 puffs per cartridge which is a class winner. 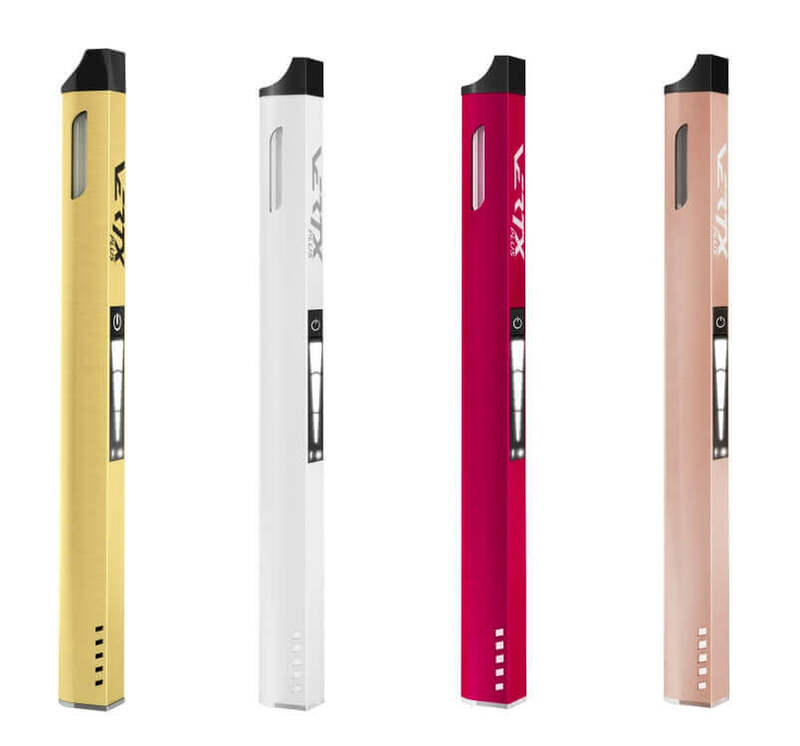 The Vertx also boasts magnetic charger and refill connections and pass through charging facilitating ease of use and uninterrupted vaping. The Vertx vape pen has a variable voltage settings 3.5 volts to 4.5 volts, which means that you can adjust the temperature and hence the amount of vapour produced depending on how “strong” you want to vape. This will obviously increase and decrease the nicotine hit based on your preference. The variable voltage is available on the Vertx Plus and is neatly activated by a simple swipe over the touch-screen indicator. This same method is also used to adjust brightness settings or simply to turn off screen lights enabling stealth mode. V2 also state that the Vertx has 2 times as many puffs per cartridge as previous V2 models or the Juul. Better battery life is also a major feature as the Vertx battery has double the capacity of the vast majority of smaller form vape pens – 420 mAh! The Vertx comes in a variety of modern and vibrant colour options, to suit all tastes and styles. This is the modern day e cigarette vape pen with creature comforts. Simple to adjust to your personal vaping style and mood. Advanced technology in a simple and practical small scale yet powerful vape pen device. There is nothing this small and this good that competes. Introducing Vertx from V2. We started with a blank sheet of paper and finished with a masterpiece; incorporating innovative features, touch screen control and variable voltage and three times more puffs per cartridge, an e liquid gauge, a battery level indicator and a magnetic charger with pass-through operation. Vertx is like nothing you have ever seen but since our customers designed it, it’s exactly what you’d expect from V2. The flat surface stops the Vertx rolling off the table, the power meter keeps you informed, the inductive touch screen lets you easily control voltage and vapour and you can turn the screen off for stealth operation. The advanced cartridge system features an all new hyper-efficient heating element. It clicks securely into place with magnets – no threading no leaks.